Many of us know the story: Jane Goodall lived in Gombe immersed in the lives of wild chimpanzees, allowing her to unlock truths like no one had before, revolutionizing the way we understand our closest living relatives and ourselves. The story you may not know is how Jane’s approach to science wasn’t the only revolutionary thing she pioneered. Learning as much as she did about the unique and extraordinary lives of chimpanzees, she realized that as threats to their existence increased, she would have to do something to protect them and their habitats. 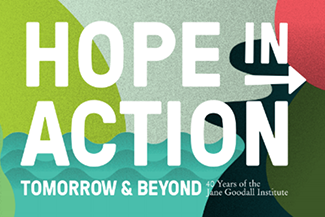 She created the Jane Goodall Institute to do just that – and today, we’re taking another revolutionary leap forward. JGI is launching a BRAND NEW strategy! This new guide is a window into how we’re taking Jane’s vision for a more harmonious world for all living beings, into the future. This forward-facing strategy zooms in on and frames what works best to protect great apes, improve the well-being of people, protect habitats, and grow the next generation of compassionate changemakers through our Roots & Shoots youth program. 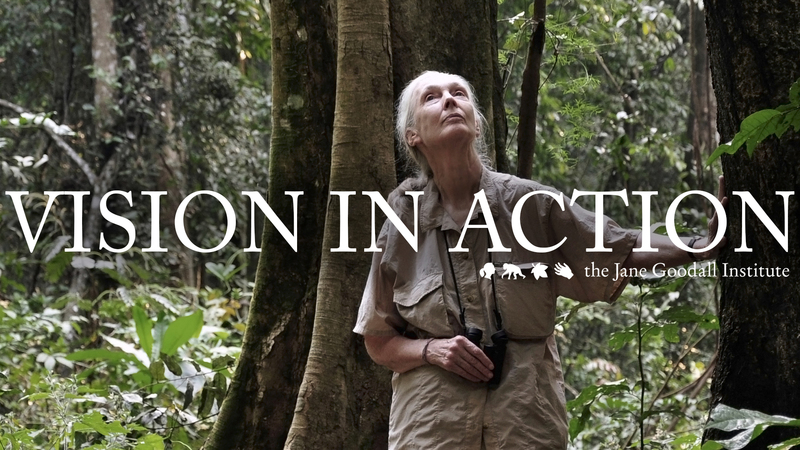 Jane Goodall’s vision is our mission. Jane understood, before many others, that everything is connected. For over 40 years our research in Gombe has grown true understanding of chimpanzees and other wildlife, and for over 25 we’ve been putting communities at the center of our conservation efforts to establish effective and long lasting solutions. This strategy gives us the precision and adaptive momentum to pursue new heights of greater understanding and protection of apes and their habitats. It also builds the architecture to expand our influence in growing an informed and compassionate global society who will help create a better world for people, other animals and our shared environment. GOAL 1: Ensuring the conservation, understanding and welfare of chimpanzees & other great apes. GOAL 2: Inspiring and empowering people around the globe to make compassionate, sustainable and holistic choices. Why & how do these two goals go together? Why? Great apes are our closest living relatives. Thanks to Dr. Jane Goodall’s groundbreaking research and ongoing studies in Gombe, Tanzania, we’ve discovered so much about our similarities to these remarkable beings, and the true nature of our relationship to rest of the animal kingdom. We know, thanks to Jane and our ongoing research, that chimpanzees have complex emotions, make and use tools, close social bonds, have unique personalities and impressive intelligence. We have also learned that chimpanzees are at risk of disappearing forever if we do not do something immediately – from a population of over one million just 100 years ago, only around 340,000 remain in the entire world. Great apes, and particularly chimpanzees, are keystone species – as their populations decline and suffer, so too do thousands of other species and their ecosystems upon which humans also depend. We also know how we ended up here; Short sighted and self serving decision making is happening all around the world and the decisions made today have major effects for all life on Earth tomorrow. If we can’t support young people who want to improve their communities, while thinking and acting compassionately and sustainably, we’re going to witness climate change, species loss and other tragedies on a scale we’ve never seen before. By working to build conscious citizens, while understanding and protecting chimps, we’re making sure the future is green and bright for all. How are we using this new strategy to advance our mission? 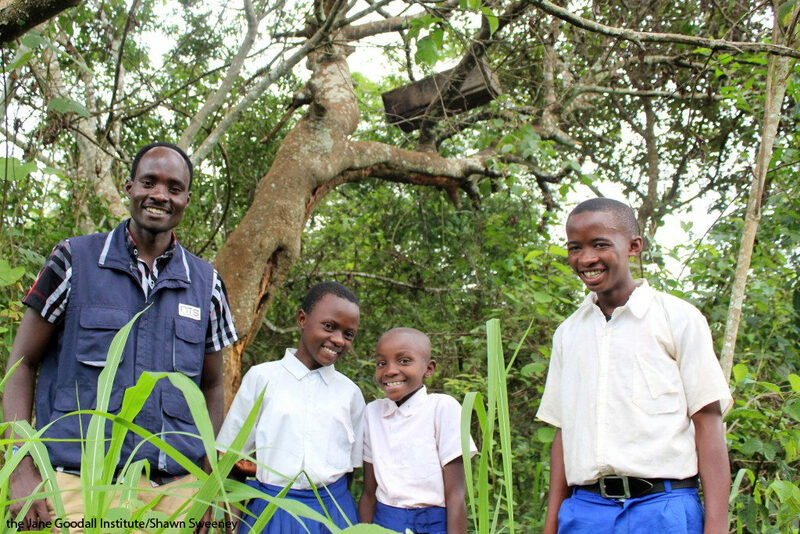 Tacare: Community-Centered Conservation – This is what put Jane’s approach to conservation on the map, and has made our work so successful and enduring in our sites around critical great ape conservation areas. Everything we do at JGI is based on the understanding that we must work collaboratively with local communities to listen to their needs, building the support and providing the tools to create improved and sustainable well-being. Our projects include efforts like sustainable livelihoods, natural resource management, providing training and resources for improved health and family planning, land-use planning, and forest management. When all of these parts work together, human populations are better able to sustainably grow and use natural resources, without destroying habitat or harming chimpanzees. Understanding Chimpanzees – We’re responsible for groundbreaking research in Gombe that continues from Jane’s initial studies. It is now the longest running wild chimpanzee study in the world (nearly 60 years and counting), and continues to deliver brilliant insights about primate behavior, ecology, evolution, zoonotic disease and human/chimpanzee health. Through the new strategy, we’re concentrating more than ever on advancing this work and making the discoveries available to even more people. Chimpanzee + Other Ape Welfare – We’ve been at the head of the class in rehabilitation and sanctuary care/standards through our Tchimpounga sanctuary and others in Africa for two decades. These efforts are creating first-in-class standards for sanctuary care, work to prevent illegal wildlife trafficking through work with law enforcement and public awareness campaigns, and give rescued chimps a second chance. It is also part of our larger work to reinforce and advocate for best in class sanctuary and captive care for apes around the world. Roots & Shoots – Our youth empowerment program exists in 50 countries around the world, and over the years we have had Roots & Shoots in more than 100 different countries, growing an informed and activated compassionate citizenry who are agents of positive change. The R&S program increases compassionate competencies and skill building – including community mapping and project-based learning – creating a generation who make holistic decisions for a better world. Our new JGI strategy provides a runway for the Roots & Shoots strategy which aims to expand, diversify, and amplify the program so that the values of compassion and sustainable decision making grow a widespread movement of people who protect our shared planet. Many of the young people who have passed through Roots & Shoots are now taking their R&S knowledge into their adult careers around the world. 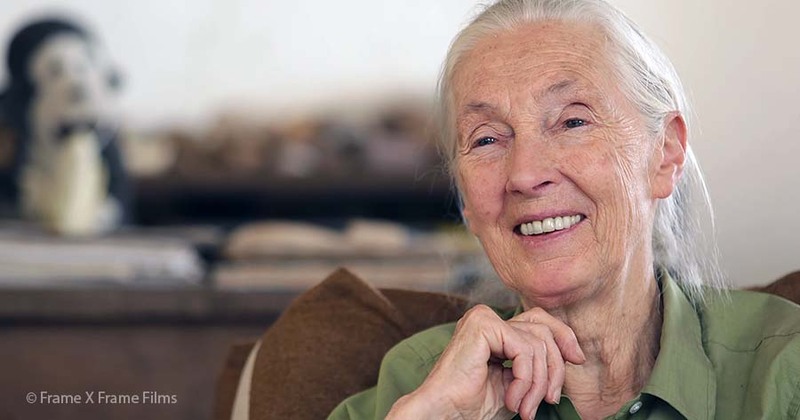 Jane’s Influence/Legacy – By educating a new global audience, partnering with academia and media creatively we’re using Jane’s life, work, artifacts, philosophy and example to inspire compassion-driven action for biodiversity conservation, peace and a sustainable future for all. 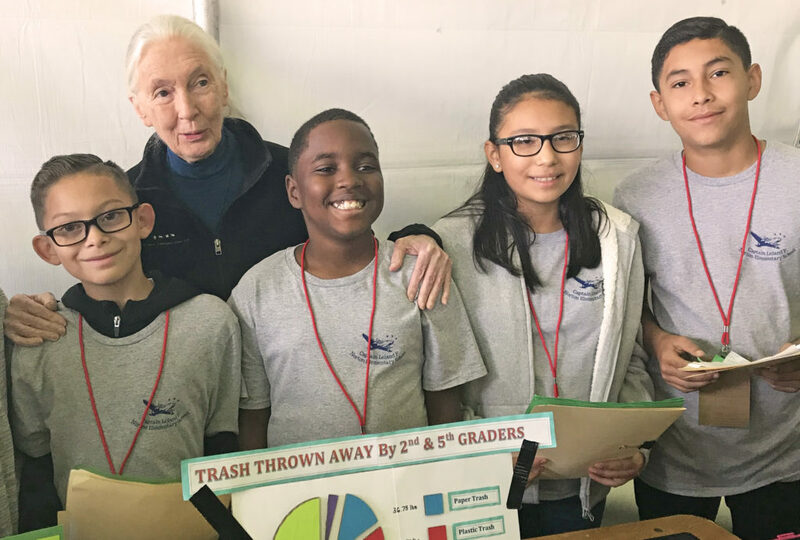 Policy + Advocacy + Corporate Relations – Using our platform and Dr. Goodall’s to support and promote awareness for major threats to wildlife/great apes, people, and the environment. Science & Tech – At JGI our decision making is led by collaborative science and enhanced by innovative technology. Our singular place as leaders of long-term research and actionable information/tool creation allows us to create relevant long-lasting solutions where and how it’s needed most. Community Engagement – Our work is only possible because of each of you who choose to make a difference every day as a part of our community. We’re creating a huge movement of people in person and digitally who care about, invest in and serve as ambassadors of our work. This is how we spread hope that turns into action! Operations – We’re investing in the resources, talent and processes to make a solid foundation and path for growth for the entire organization so that we can accomplish our mission for years to come. At JGI, we understand the interconnectedness of all life on Earth. Our approach addresses threats holistically to build solutions that work. Our new strategy tackles all of the issues facing people, great apes, other wildlife + the planet we share as an integrated approach, with individualized applications. This unique strategy, grounded in best conservation practices, is built on hope and fueled by action – it’s turning Jane’s vision into a reality. You have a role to play. We can’t do any of this without you. You can learn more about our work here and support our new strategy by donating today. Previous ArticleChimps in Gombe Teach Us So Much…What About Monkeys?